The results of the latest survey carried out by the Shrewsbury to Aberystwyth Railway Liaison Committee (SARLC) have been published on their website. The 39 page report follows passenger surveys carried out in April/May and July/August 2017 to ascertain both customer satisfaction and passenger loadings. There are a number of conclusions in the report, the most notable being “There is a proven need to introduce an hourly train service at the earliest opportunity on the Shrewsbury to Aberystwyth rail line serving Mid Wales”. It is also conclude that “Extra trains are needed to reduce the overcrowding experience on a a large number of trains, particularly between Machynlleth and Aberystwyth. Although not surveyed there is a need for a 4 car unit for all Birmingham International to Shrewsbury services which proceed along the Cambrian Lines”. The full report (PDF) can be viewed on the SARLC website both in Welsh (Click here) or in English (Click here). Note that clicking on either of these links will open a new browser tab/page. Following the delivery of a petition last week to the National Assembly for Wales, the Cabinet Secretary for Economy and Infrastructure, Ken Skates, has sent a letter to Carno Station Action Group confirming that Carno is now on the list of stations to go forward to Stage Two of the New Stations Assessment Program. The petition contains 878 signatures and was presented to the Petitions Committee of the National Assembly for Wales to demonstrate that there is still a huge local demand for the station to be re-opened. On the 28th July 2017 it was announced that a new station has been approved for Bow Street with funding from the UK Government and the Welsh Government. Carno Station Action Group then began an intense campaign, writing to Welsh AMs and in particular to Ken Skates, arguing that as Bow Street was now going ahead, Carno station should replace it as the Mid-Wales candidate on the list of 12 station to go forward to Stage 2. Almost six months after the New Stations Assessment Program was announced, Ken Skates has now agreed that this will happen. On Wednesday the 4th October 2017 a petition was presented to the National Assembly for Wales Petitions Committee on the steps of the Senedd in Cardiff. The petition has 878 signatures and was delivered by 6 members of Carno Station Action Group. The group presented a similar petition just over 10 years ago and wanted to show the NAW and the Welsh Government that the campaign for the re-opening of a station in Carno is as strong as ever and is has substantial support from the local community. A number of regional AMs joined us on the steps to show their support for the campaign including Russel George, Joyce Watson and Neil Hamilton. The petition is due for consideration by the Petitions Committee at their next meeting on the 18th October. To view the status of the petition on the NAW website Click Here. To see the previous News item with the text of the petition Click Here. On Monday 11th September some of the members of Carno Station Action Group were interviewed by Craig Duggan of BBC Wales regarding the 10th anniversary petition to be presented on the 4th October. The interviews were carried out in both Welsh and English and separate news items were subsequently shown the following evening on Newyddion 9 on S4C, and BBC Wales Today on BBC 1. Click on the images below to watch either the Welsh or the English version. 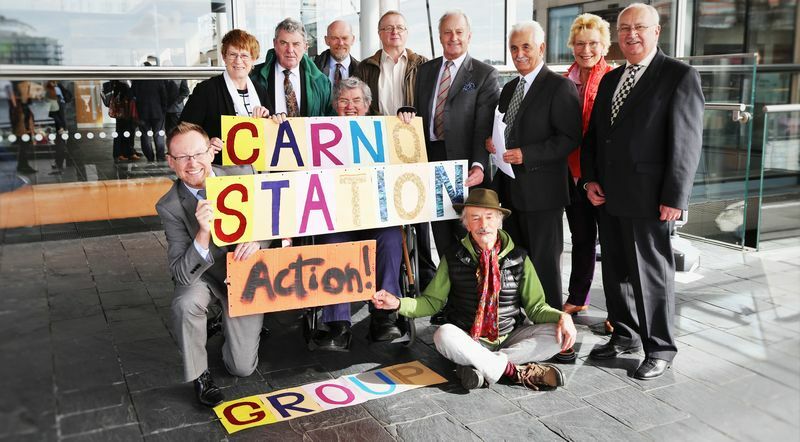 In 2007 Carno Station Action Group travelled to Cardiff to present a petition to the newly created Petitions Committee of the National Assembly for Wales. There is a News item HERE with a report and pictures of the petition being handed over on the steps of the Senedd. Since then a huge amount of work has been carried out by the Action Group to illustrate the benefits of opening a station in Carno which is on the longest stretch of line in Wales without a station. Since the recent enhanced service was introduced, twenty four trains now pass along the line each day without stopping in Carno – and we still do not have a commitment from the NAW to seriously consider the work which has been done. In May, without warning or external consultation, the NAW introduced a new three stage process for evaluation of new stations in Wales and produced a list of 12 stations which had been “scored” in the first stage of the process and would now proceed to stage 2 with a more detailed assessment. Only four stations were on the full list for Mid-Wales and only one was on the list of twelve – Bow Street. Putting aside the fact that we disagreed with the scoring system used for stage one, and and that the figures used were incorrect, in June it was announced that Bow Street had been granted full funding from the NAW and the UK Government to build a station which is estimated to be completed in 2020. This we believe, makes a nonsense of the new process and we are now pushing hard to put Carno on the initial list of 12 stations in place of Bow Street. As part of that push we have decided to present a new “Ten Year Anniversary” petition to highlight our frustrations and show that there are still a huge number of people who support the opening of a station in Carno. The new petition will again be presented on the steps of the Senedd on Wednesday 4th October. We will be collecting signatures right up to the last minute so if you want to add yours, forms are available in the Spar shop and in the Aleppo, as well as other shops around the area. We, the undersigned, welcome the development of a Business Case for the re-opening of Carno station, following Carno Station Action Group’s petition to the Assembly 10 years ago. We note that the revised Business Case demonstrates a ratio of benefits to costs of 1.65 and that the stopping of most trains at Carno is compatible with the existing enhanced timetable. Carno is a relatively remote community on the longest stretch of railway without an intermediate station in the whole of Wales and a station here would open up dramatically improved, sustainable access to jobs and services. We therefore call on the National Assembly for Wales to urge the Welsh Government to reopen Carno station within a 5 year timescale. Carno Station Action Group have today written to every Welsh AM expressing our deep concern that Carno station is not in a list of stations for potential re-opening in a letter from the Cabinet Secretary for Economy and Infrastructure, Ken Skates. The letter from Mr Skates to all AMs sent on 26th April can be viewed by clicking here. Our letter can be viewed by clicking here. Since the last newsletter there have been delays in making progress. Unfortunately Edwina Hart, the Minister with whom we had made significant progress, retired at the Assembly elections last year and we have had to go over much ground again with the new Minister and his senior staff. It has often taken a long time, and reminders, to receive replies to correspondence seeking information. Only the original 2-hourly trains to stop at Carno; a similar situation to some stations on the Manchester/Holyhead to Cardiff line. The introduction of Carno stops would result in a slight reduction of the current extended stops made by trains at Shrewsbury station. We have produced several draft timetables and submitted them to Welsh Government officers for consideration. In practice these need to be reviewed by Network Rail and Arriva Trains Wales and we have asked the WG officers to facilitate this. The situation is complicated by the forthcoming franchising round, when companies will bid to run the rail services in Wales from 2018 onwards. We have shown that there is a strong business case for the station and that there is a great local need for it. That is not disputed. We continue to press the Welsh Assembly Government for responses to our requests with the help of our very supportive local and regional AMs and we can assure WG that we will not go away. We are also arranging meetings with the companies involved in the franchise bidding. We are holding a drop-in session for residents and invite you to come to discuss the station proposal and find out more about what we are doing. The Shrewsbury to Aberystwyth Rail Passenger Association (SARPA) has published a long and comprehensive history of the our campaign so far in its Spring Newsletter. The article, written by CSAG member Tony Burton, details the long and often tortuous journey over the last 15 years since the Carno Station Action Group was formed. You can read or download a PDF of the article by clicking here. The Carno Station Action Group has sent a letter to each of the Wales and Borders Franchise Bidders inviting them to a briefing on the continuing campaign to open a station in Carno. The Franchise Bidders are: Arriva Trains Wales, MTR Corporation (Cymru) Ltd, Abellio Rail Cymru Ltd, and Keolis Amey. The letter has also been circulated to Transport Wales. Carno Station Action Group have today, sent a letter to Ken Skates, the National Assembly for Wales Cabinet Secretary for Economy and Infrastructure. The letter expresses deep concerns regarding the confusing findings of a PRA Operations Planning Timetable report on the timetabling of trains stopping at Carno. To clarify the situation, CSAG has requested a meeting with NAW officials as soon as possible.